It's going to feel strange for Bungie to someday go head-to-head with the franchise the studio has worked on for the past decade. 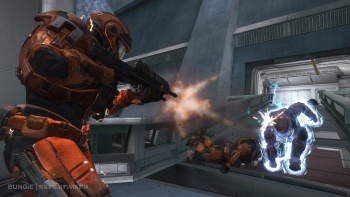 After Bungie releases Halo: Reach on September 14, the developer will move on to a new original IP at Activision. Microsoft has every intention of keeping Halo going without Bungie, which would in essence put the developer in the position of competing with itself once it leaves Microsoft's umbrella. To Bungie, this feels "weird." Bungie community manager Brian Jarrard told CVG that when the company will be going up against Halo at an undetermined point in the future he thinks it'll "feel maybe a little strange." However, he doesn't mean that Bungie is worried that Halo will eclipse its next project. "We're really confident about the ideas we're already working on for our next project and we're going to be doing things that will hopefully help shape the next ten years of gaming," he said. Still, he admits: "I do think it'll be strange... not too unlike the first time we all sat down and played Halo Wars and saw someone else's take on the Halo universe, or even watching Halo Legends - that's a piece of Halo media that we had no involvement in." Though it'll feel weird, Jarrard says that on some level it'll be okay to let go of Halo, because he believes: "At a minimum it'll be cool knowing that we started all that - it was our team that made this possible." I don't know, I think I'd be somewhat annoyed if something I created went on to earn someone else's company millions of dollars, especially when that company didn't even approve of the Halo name at first. Then again, Bungie probably won't need any help becoming both creatively and financially successful at Activision. Still, it's sort of like having a child, and then being forced to let someone else guide that child's life while you have a new child with someone else, knowing that the two children will fight to the death someday down the road. Isn't it?